We headed out down I-65 from Louisville to Bowling Green. This was going to be a two hour drive instead of the 45 minutes I had thought all trip. I don’t know how I messed that up, but it is a good thing we realized it before we left too late. I guess at this point I should ruin any potential sponsorship with Dodge. The Dodge Nitro rental may be the worst car I have ever driven. It was constructed of cheap plastic more suitable for McDonald’s happy meal toys. But far worse was the way this car drove. I had to pound the pedal to get this thing moving and it went from 0-60 in 2 days. I will not dwell any further, but I think we will be avoiding the Dodge Nitro in the future. Again, sponsorship opportunities are still available. We arrived at WKU after an uneventful drive from Louisville. After finding a parking spot, we set out on a walking tour of the campus. The campus was bursting with activity with the game still 4 hours away. The WKU campus was small but very picturesque. It was essentially a rectangle and on a steep hill. We hiked up to the top and got a great view of the surrounding area. Nice campus! A ski lift from the bottom to the top of the hill would be a nice addition. The coeds on campus were dressed very nicely. We are not sure if this was due to special homecoming events or something else, but the campus was certainly dressed up as compared to other places. Also, the scenery was very nice. It was very helpful that the weather was beautiful. It is very difficult to pack for trips where it is 30 degrees at night and 70 degrees during the day. But 70 degree days make for some very nice scenery. The tailgating scene was very impressive for a school of WKU’s size. There were a lot of tents and activity just outside one of the end zones. We were very impressed with the whole environment and atmosphere. Al adds that it was very organized as well. Normally you find maps of the campus on campus as you walk around. WKU also had a map of the tailgate area, so you’d know where to find everyone. It was at this point that we met Michael Schroeder of the WKU athletic department. I had contacted WKU prior to our trip and they very graciously offered to give us a tour of the facilities. Michael gave us a tour of the football stadium, locker rooms, weight rooms, luxury suites, and press box. During the tour we ran into the AD Ross Bjork. Later we found out it was his birthday, it would have been nice to know that prior. During the tour, we saw one of the coaches giving a pre game talk to the luxury suite ticket holders. This made me a little nervous about team focus and I would have been a lot more comfortable seeing that after the game, but I guess money talks, as usual. After talking with Michael for awhile and him hearing that we were also basketball fans, he gave us a tour of the basketball arena as well. I would love to spend a football Saturday watching games in the basketball players’ lounge. Overall, WKU has excellent athletic facilities. It was very interesting to hear about the legend of the red towel and that E.A. Diddle was Tark before Tark was Tark. The story also makes the WKU logo make sense. Michael also filled us in on the story of Big Red and the spirit of Western. I guess it is very difficult to make a mascot out of Hilltoppers. WKU has some very nice traditions. After a very nice tour, we parted ways with Michael as game time was approaching. Avery sincere thank you to Michael, Ross and the entire WKU athletic community that made us feel very welcome. Prior to our trip, Al contacted some local media outlets to inform of our visit. We received a lot of interest from various outlets in Bowling Green. Before our departure, we taped an interview that ran on the local sports radio station AM1340 with Norm Haney, host of “The Sports Guys” talk show. The interview went very well and Norm did an excellent job in getting to the core of what we are all about, and making us feel very comfortable discussing anything from soup to nuts. Sidney Blanford and the WKU Herald also expressed significant interest in our visit. The Friday edition ran an article about us based on an interview we did with Sidney. She also wanted to do a follow up feature with our views after the trip. As part of this feature, they wanted to have a photographer with us at the game to get some pictures that would run with the feature. We met the photographer outside the stadium before proceeding inside for the game. We took our seats at the 5 yard line, 3rd row of the upper stands. Al and I both picked UL Lafayette and can you blame us given WKU’s 18 game home losing streak? WKU won the toss and took the ball. Six plays later WKU led 7-0. ULL took the ensuing possession 10 plays, but the WKU defense held inside the ten yard line and forced a field goal. WKU punted on their next possession and ULL took over on their 11. On the fourth play, WKU got the big break they were looking for as ULL fumbled and WKU recovered on the ULL 36 yard line. Three plays later we were at 14-3 WKU. And the crowd began to sense that today could be different. Or is that grumbling my pre game Bratwurst? It could be either. But maybe not, as ULL took 1 play to go 79 yards for a TD. 14-10. WKU drove down to the ULL 11, but threw an interception to end the drive. It would be 3 plays and out for ULL. WKU took over on their 35 and Bobby Rainey would take over. On a 12 play TD drive, Rainey ran the ball 8 times, 21-10. ULL would then take the ball and go 9 plays and 75 yards to close the gap to 21-17. This would bring us to halftime. The first half seemed to go WKU’s way, but despite being on a two game winning streak, they were all on the road. WKU was trying to break an 18 game home losing streak. At halftime, we moved our seats to the last row on the 50 yard line, right underneath the press box. This was a much better vantage point. Our personal photographer stayed with us until the end of the third where upon taking his 1,000th picture, he finally had enough candids. I think this will be the last time we allow this. The third quarter was somewhat anticlimactic after a four TD second quarter. The offenses generated only 36 yards in the first four possessions. The only scoring in the third was a Bobby Rainey 5 yard run giving WKU a 28-17 lead. As we entered the fourth quarter, WKU held an 11 point lead and the crowd began to sense that something was happening here. ULL opened the fourth with a TD and a failed 2 point conversion. WKU led 28-23. WKU would need to answer and answer they did. The very next drive, WKU takes it in for a TD to bring the lead back up to 35-23. The next drive would all but end the game as ULL failed on a fourth and goal. A few possessions later Bobby Rainey would need only two rushes to go 80 yards and make the score 42-23, which is where it ended. Bobby Rainey ran 32 times for 206 yards of which 99 came in the fourth quarter. It was a tremendous performance. WKU racked up 507 yards and ULL gained 540 of which 419 came in the air. But you would never know it as ULL was trailing the whole game and was just trying to keep pace with a devastating rushing attack by WKU. And thus, the 18 game home losing streak was over. The crowd stormed the field. As an aside, I think the replay official had a personal beef with the referee. Every single play to our right that was close was reviewed. This forced the referee to have to run the length of the field. Not a single call was overturned. I think the replay official just wanted to make the referee run. This was the first game of the quest where the crowd stormed the field. I am of the opinion that the SEC has this right where the home school is responsible for ensuring there is enough security to prevent a storming of the field or court. If it occurs the home team is fined. But that is at 100,000 plus stadiums where it would be incredibly dangerous. But for a school like WKU, this was well deserved. The team stayed and partied with the crowd, at least for a little while. Bobby Rainey took pictures and signed autographs with all comers until his coaches pulled him back to the locker room. It was a great party atmosphere on the field after the game. I would like to think that the team was inspired by our visit and that we propelled them to victory. Therefore, I am expecting that we will receive all expense paid trips to their remaining games as this victory places them right in the middle of the race for the Sun Belt Conference Championship. I am not holding my breath waiting though. I am curious about one thing though. During the game, there were lots of empty seats. Announced attendance was 15,122 and this was probably high. But the tailgate area just outside the end zone was packed. Do people really not come into the game? I guess if you have lost 18 in a row, you just expect to lose, but you have to take a 3 hour break from tailgating and come into the game. If only for a little bit. But at the end, sensing that WKU was on the verge, it did get a little more crowded in the stadium. Al blew a golden opportunity to gain ground on me but we both ended up going 0-2 on this trip. Not a good result, but we did see two very exciting games with unexpected results. We had been warned that Bowling Green was a chain restaurant town and after driving to the hotel, that was most certainly the case. But we did take the recommendation from Michael and opt for a local joint called Double Dog Chow House for dinner, drinks, and late game football. Food was typical bar joint food, but was very good. Definitely a notch or two above your typical bar food. It is recommended. After dinner and some good college football upsets, it was back to the Sleep Inn for sleep. This was the first time I have ever been in a Sleep Inn and if this is any indication it is very promising. Very nice, clean, lower cost hotel. I will have to keep that in mind. Great value! It was another early wake up to make our flight out of Louisville. But as usual, first we had to stop by the stadium for some field goal kicking. 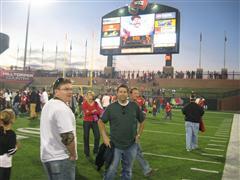 It was no problem getting onto the field, after all the entire student body was on it the night before. Al went 0 for 1 and quit, making him 0 for 3 for the trip. An interesting (at least to me) note is that WKU outsources stadium clean up. This is a missed opportunity for the athletic department budget. Ross, I have a tip for you. You need to force the frats to send a cleaning crew to help clean the stadium as part of their community service. They will then send their pledges to clean. And thus you have free labor. Just rotate around and each frat will have to do one or two games. Problem solved and more money in the budget. We then headed out for the drive back to the Louisville airport. If this is horse country, how come we did not see any horses in either direction on the two hour each way drive between Louisville and Bowling Green? Any thoughts? I am now going to use the power of the pen to rant against Dollar Rent A Car. When we arrived and picked up the rental car, the lot attendant said that he would give us a 10% discount upon departure because they gave us the wrong parking spot location and the alarm remote did not work so it took us some time to find the car. We did not ask for this, but it was given and noted on our receipt. When we returned the car, there was no lot attendant, so we had to wait on line inside the terminal to return the car. This annoyed me far more than having to find the car on pickup. But anyway, when we got to the counter, the woman would not honor the discount. At this point, I just wanted to return the car and go check in for the flight. But she insisted on getting the full story behind it. Being really annoyed, I proceeded to give it to her. She told me she could give me a 10% coupon on my next rental. I told her that I did not want anything but to return the car. She then got annoyed at ME for me being rude when she was only trying to help. Let me recap. I did not ask for a discount, but got one. When returning the car, no one was there to receive it. I waited on line to return and she would not honor the discount I never asked for. She made me retell the story and then offered me a coupon. And I am the rude one. Nice customer service Dollar. Your staff needs better training and in the meantime you are now on the bottom of the list of rental cars companies. While I am in the ranting mood, the Quiznos at the Louisville airport, US Airways wing, needs serious help. I understand these airport locations are nice money makers for these chains, but they can really do serious damage to your brand. This Quiznos was so disorganized and backwards that I feel like never stepping foot in one again. Eat before you get to the airport. At last, we boarded the 50 seat jet and headed back to New York. Due to the WKU win and resulting coverage, our feature in the WKU Herald was nixed. We did make it into a photo in the next edition, but our feature was off. I guess the 1,000 pictures taken of us during the game are no more. Good thing photos are now all digital or that would have been a waste of a tremendous amount of film. 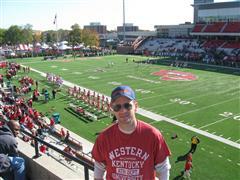 In 2002, WKU won the NCAADivision I FCS National Football championship. In 2006, the school voted to move the team to the Division I Bowl Subdivision (formerly I-A). After two years of provisional status, they began to compete in 2009 as a member of the Sun Belt conference. You can clearly see that WKU has successful roots and a great foundation to be successful at the I-A level. The facilities are there and I think this is a program that after an adjustment period can be wonderfully successful competing for Sun Belt titles. We wish them all the luck. ULL entered this game at 6-1, but finished 2-3 including this loss to Western Kentucky. The Rajin’ Cajuns beat San Diego State in the R+L Carriers New Orleans Bowl to finish with a 9-4 record on the year. Western Kentucky lost its first four games of the year, but won 7 of their last eight to finish 7-5, with the only loss in that stretch coming to the LSU Tigers, which lost in the national championship game. The Hilltoppers with a 7-1 conference record just missed winning the Sun Belt Conference as Arkansas State went 8-0 in conference play. Due to Sun Belt Conference bowl tie ins, Western Kentucky was the only school with a winning record that did not go to a bowl game. UCLA in being granted a bowl waiver (due to their losing the Pac 12 championship game) at 6-7 could be accused of taking the Hilltoppers bowl game away from them.